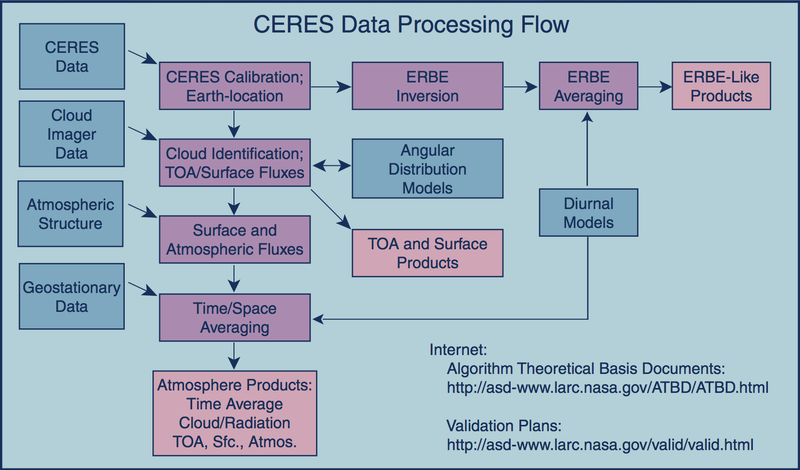 A key element in the success of CERES, beyond the development of an instrument, is the development of data analysis and interpretation techniques for producing radiation and cloud products that meet the scientific objectives of the project. This data analysis yields three major types of archival products. The CERES data product descriptions are given in the Data Products Catalog that can be accessed on the web here. CERES TRMM data can be accessed through the Langley Distributed Active Archive Center (DAAC) at https://eosweb.larc.nasa.gov/ . ERBE-like Products are as nearly identical as possible to those produced by the previous generation ERBE instruments. These products include broadband shortwave, longwave, and net radiative fluxes for both cloudy sky and clear sky conditions. ERBE-like products are used for climate monitoring and climate change studies when comparing directly to ERBE data sources. Top-of-Atmosphere (TOA) and Surface Products use cloud imager data for scene classification and CERES measurements to provide radiative fluxes for both cloudy and clear sky conditions. Surface radiation budget estimates are based on direct observational relationships between top-of-atmosphere and surface fluxes. TOA and surface products are used for studies of land and ocean surface energy budget, as well as climate studies that require high accuracy fluxes. Atmosphere Products use cloud physical properties, temperature, water vapor, ozone and aerosol data, and a broadband radiative transfer model to compute estimates of shortwave and longwave radiative fluxes at the surface, at levels within the atmosphere, and at the top of the atmosphere. The CERES TOA radiative fluxes are the "truth" reference used to constrain the theoretical calculations. Atmosphere products are designed for studies of energy balance within the atmosphere, as well as climate studies that require consistent cloud, top-of-atmosphere, and surface radiation data sets.